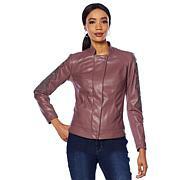 Whatever the activity, from sports to shopping to sightseeing or just cruising downtown, this lightweight jacket makes the perfect cover for casual wear. I purchased this jacket in both black and navy, along with the matching side snap jogger pants. I will get a lot of use from these sets. I have worn them on dress down days at school, to Zumba class, and as comfortable, yet stylish weekend wear. I am very pleased with this purchase! This jacket is so cute. My cousin bought blk/white , she showed me and I immediately bought blk/whi . I then showed my sister and she bought it. We love jacket and pants. We have both blu/whi outfit and Blk/whi outfit. Jacket and pants fit nicely. Just too cute. Can be dressed up with hills or down with tennis shoe. Love this outfit! Definitely great for looking fit while running errands. Im so glad I purchased it. Do it again GG. Got this colorblock sport jacket and the pant that goes with it, and I love it!!!! The fit is spot on and the design and fabric/workmanship is superior. I will buy more from Giuliana's line, you bet! Highly recommend.